Decide what you wanted or needed. Lawn, xeriscape, trees, desert plantings, boulders, aggregates or combinations are possibilities. If aggregate or rock is used, different rock colors and sizes add both dimension and contrast. Make a simple sketch of your yard. Consider investment costs of both material and labor to remove (old) and install (new). review maintenance time and costs including irrigation or watering. Ask the experts at Whiting Brothers about your concerns, questions, or problems. It is important to estimate the surface areas of a project. This applies to both grass and rock designs. "Square off" each area on the yard sketch. Measure the length and width of each section. Then multiply lenght X width of each section. This provides the surface area (to be covered). These caculated surface areas or the original yard sketch measurements can be provided to the material supply company or the landscape company. You, the home owner may specify material depth or the supplier may recommend material depth. Typically, 1/2 inch or 3/4 inch rock is installed at 2 inch depths and soil or lawn mix should be 3 inches deep. Generally, depths less than 2 inches are inadequate. Depths greater than 3 inches are unnecessary and costly. 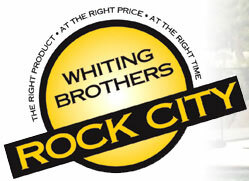 Whiting Brothers recommends a 2 inch of depth (minimum) for rock 1/2 inch or 3/4 inch rock. If the rock used is 2 inch to 4 inch cobble or "chunky", a minimum depth of 4 inches is recommended. Chats or 1/4 minus rock are used around planting areas, walkways, or driveways. A 2 inch depth is recommended for planting areas. 3 inches of chat for walkways and 4 inches for driveways properly compacted will provide a solid base. If grass is planted or sod is installed we recommend installation of 2 inches to 3 inches of premixed soil or mulches. We also recommend that the exisiting base soil be roto-tilled or aerated to permit better moisture penetration. Ground preparation is very important. Weeds should be pulled or sprayed with weed killer and removed. Sod should be dug out or cut out with a sod cutter. Attempting to install rock or new lawn over or on top of old lawn will excessively elevate the new installation. This may result in drainage problems and material spillage. If a lawn is planned, the EXISTING SCALPED soil should be tilled 3 inches to 4 inches deep before installation of new soil bases. Lawn fabric should be installed after the old sod and/or weeds have been removed. Do not use plastic as a weed barrier. Plastic does not permit passage of water. As a consequence, water will pond in low areas. More importantly, rock will puncture the plastic when walked on. Punctured plastic will allow weeds to grow through holes. Also, heated plastic ages quickly, becomes brittle, and literally disentegrates. Lawn fabric is tough, does not puncture easily, allows water to pass through, blocks weeds and grass regrowth. Lawn fabric is significantly more expensive than plastic. However, fabric is well-worth the added investment cost. Las Vegas soils are considerably different than soils in other areas. A certain amount of salt, much like table salt, is present in our native soils. Also, our native soils have problems with excessive salts, are very alkaline (high PH), have boron toxicity, and low nutrient levels. Premixed soils such as Ferta lawn mix with 35% organic material or Ferta Super Gro with 50% organics will address basic lawn and garden needs. A soil test will provide necessary information to help develop an ideal soil environment. A basic test provides soil composition, nutrient levels, presence of other key elements, and recommendations to improve or correct the subject soil. Contact the Las Vegas Valley Water District, Desert Demonstration Garden at 702-258-3205 for assistance. LAWNMIX - A premixed soil to use as is. Use on top of existing soil at a depth of, at the very least, 2 inches deep preferably 3 inches deep. SUPERGRO - A premixed soil for the garden, planting trees, shrubs etc. Richer than Lawnmix. NUTRIMULCH - Composted turkey manure to be used as a soil conditioner. SAND - Loose, gritty grains of disintegrated rock. SOIL - The surface layer supporting plant life. CHAT - Used as a driveway or walkway…also used as a ground cover in planting areas or on mounds.